Wright State University dedicated the Vishal Soin Innovation Park, which will create new opportunities for research and innovation in the Dayton region. 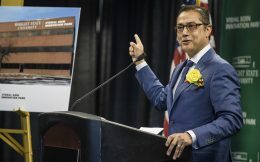 The Vishal Soin Innovation Park, which is supported by a gift from the Soin Family Foundation, is located on the south side of Colonel Glenn Highway, directly across from Wright State University’s Dayton Campus. Comprised of five office buildings along or adjacent to Presidential Drive, the park provides more than 220,000 square feet of space. Some of the park’s occupants include Nucleus Fairborn, a co-working facility for entrepreneurs and startups, Aerospace Business Development Associates, Aptima, Design Knowledge Company, the Wright State University Foundation and Double Bowler Properties, the university’s real estate acquisition company. The park honors Vishal Soin, a former chair of the Wright State University Board of Trustees. Soin, who is president of Soin LLC, served on the university’s Board of Trustees from 2006 to 2015, including two years as board chair from 2010 to 2012.